WOW! There is so much going on in this world. Yesterday was a special day of remembrance on the anniversary of one of the worst tragedies in our country. I saw firefighters and police officers standing on decorated overpasses as I drove home from Indianapolis with signs that said “Remember 911” and “Honk for Remembrance of 911”. 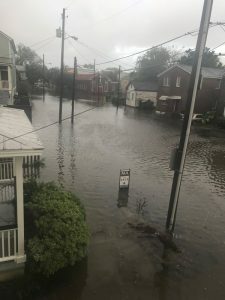 We have the storms and hurricanes in Texas and Florida that have gone up into the Carolinas and Georgia and still causing devastation as they move into other states. There are wildfires blazing in Montana and spreading to surrounding states with the smoke and ash damages traveling hundreds of miles to wreak havoc on other locations. There are many other “storms” going on in our land and around this world today that need our prayer and many people who need our encouragement. Today is National Day of Encouragement and I urge you to find someone who needs a word or a note of encouragement today. Cards, text messages, emails, phone calls, flowers, prayers and gifts are all good outlets to show encouragement. Be encouraged today on National Day of Encouragement that Jesus is in control. And then share that encouragement with those who are struggling. We can’t fix everything but we can encourage people to know the One who can! Picture courtesy of a friend from outside her house. This entry was posted on September 12, 2017 with tags: #encouragement, #jesuswalkingonwater, #kindnessmatters, #nationaldayofencouragement, #nationalencouragementday, kindness by Deanna Young.